Monto Cafe and Steakhouse, Camden Street. I have long argued that Camden Street is really the culinary capital of Dublin. Often when approached by tourists, seeking the odious Temple Bar, I am sure to let them know that Camden St is a far better option for the 3 Ps (Pints, Pallette and Price). And it stands to reason. One cannot help but be enamoured with the diverse cuisine in the area, from Afghan Grills to Japanese Sushi houses. Not only that, there is a lot of strong competition in the area, restaurants and cafes, should they not cut the muster, fail. And rightly so. Eating out is not a cheap prospect anymore, so value for money and, above all, quality are the only things that should matter. So on a recent ramble through the area, quite peckish, I decided to try the Monto Cafe and Steakhouse, and I was not disappointed. Based in the spacious 8/9 Upper Camden St (almost directly across the road from the Camden Court Hotel) Montos styles itself as “one of the best eateries in Dublin….that sources the finest ingredients”, I went in to put that quote to the test. Upon entering the restaurant, I could not help but be impressed by the decor. Pictures of Grecian philosophers share the walls with a unique artistic style that could have easily crossed the line into pretentiousness, yet found a balance that is very comfortable. The large dining room is complemented by large windows that gives the diner a view of Camden Street. And while Camden Street is something of an acquired taste visually, the owners of the Monto should be commended on the contemplative ambience that the window provides. To me, the entire ensemble harkens to an almost nostalgic mediterranean enclave one might find on their first “adult” holiday, whilst also remaining current. The staff are very courteous and professional. It may be the cynic in me (it definitely is the cynic in me) but I like to know I am in an establishment that doesn’t cling to the vagaries of trying to recreate “home away from home” dining, with their faux Americanized sales patter and borderline psychotic smiles. No sir, give me competent a courteous any day. I truly admire confident professionals, and that is what the wait staff exude in Monto’s. From the moment they seat you, they ensure that you are going to looked after. As it was still lunch time, I chose from the set menu, which is priced quite reasonably at €23.50 for a two course meal. To start, I chose the Deep Fried Brie with a side of rocket and walnuts with a soy chilli dipping sauce. Deep frying a soft cheese like brie is a bold move. Often it fails to work, either being too chewy or too melted. However the chef’s in the Monto manage to pull it off perfectly with the breaded coating and soft cheese being a perfect amalgam in regards to texture. Sometimes it seems that chefs often fear allowing a soft cheese to speak for itself. They are quick to mask the perceived blandness of a soft cheese like brie in variety of ways. The chefs in Monto’s take a different approach, they allow the cheese to be appreciated by allowing it to be itself. The result is a deceptively simple and beautiful starter. The Monto also claims to produce fine Italian cuisine, and while what I ordered certainly wasn’t Italian, per se, there was an unmistakable Italian philosophy coming from the kitchen. 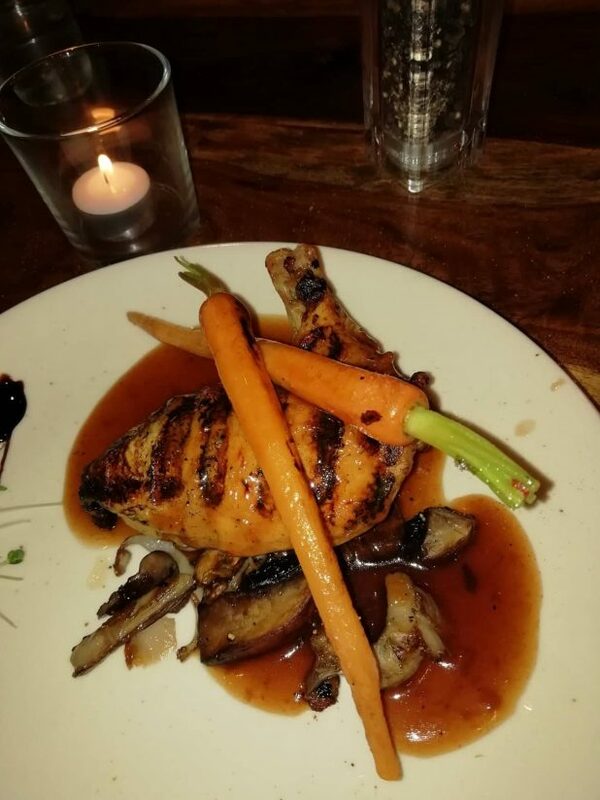 For my main, I had the Chicken Supreme with wild mushrooms, chanteray carrots in a red wine jus. I found this meal to be deeply satisfying. From the perfectly cooked chicken, to the provocative wild mushrooms, perfectly roasted carrots, all united in a red wine jus that truly completed the meal. Furthermore, one found it so beautifully presented, that one broke a personal rule of good taste and photographed the arrangement. And while taste alone shall be the testament of its quality, I suppose capturing a photograph allows others to at least be on nodding terms with its essence, should they decide to order it themselves at some stage, a recommendation I would urge. At a price point slightly higher than the average casual dining restaurant in the area, (all in, with two drinks, it cost me €27.50) one perhaps wouldn’t be inclined to make Monto’s a standard “go to” lunch spot. However, when one is so inclined to splurge a little, whether to entertain work colleagues, go on a date, or enjoy some really nice food with friends, one cannot, in my somewhat (borderline)humble opinion, Monto’s Cafe and Steakhouse makes an excellent choice.